Lots of news on the Transformers Animated front as we get ready for the next waves. Pictured above is a preview of a new Target Exclusive 3-pack. 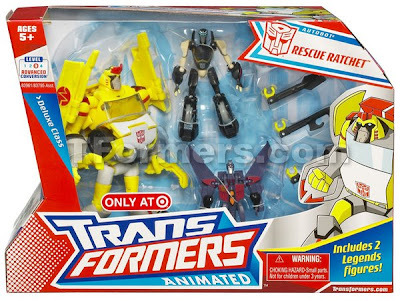 It features Rescue Ratchet (Deluxe class) as well as Starscream and Prowl (both of the smaller Legends class). Ratchet comes with a "rescue" backpack and repair tools. No word yet on when it will hit stores, but probably before Christmas. Meanwhile, Wave 4 Deluxe has appeared at some online retailers, but not at retail yet. In the $20 Voyager class, triple-changer Blitzwing was available for a limited time at HasbroToyShop, but has since sold out. He also appeared at some Walmarts around the nation in small amounts, but still not a nationwide roll-out. Leader class Ultra Magnus has also appeared at HasbroToyShop and BigBadToyStore for a short time but no signs of him at retail yet. Expect all this to change as we get into September as all of them should be showing up soon. Also, pictures have surfaced on Ebay of a repackaged Voyager Class Optimus Prime now boxed in his robot mode instead of his vehicle mode. He was one of the harder to find Animated figures, so looks like they will be pumping out some more of this popular figure soon. Update: The first image of Shockwave in package has been revealed via the usual Chinese Ebayers. An earlier video we linked to says he is due out in December.